In 2016 the HammerClub meeting was held in Legnica, Poland, as a part of the 25th Legnica Silver Festival organized by Gallery of Art in Legnica. 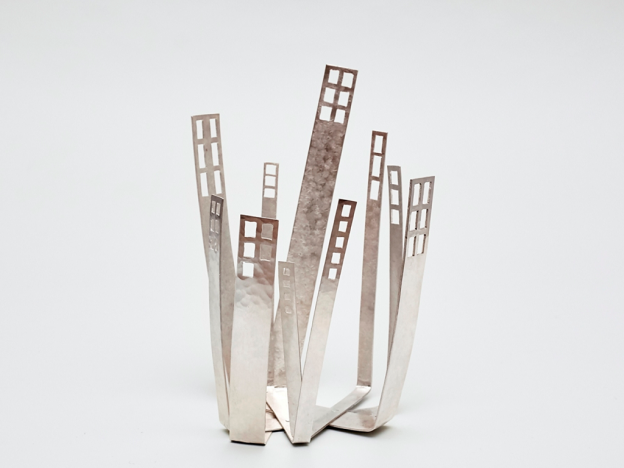 The theme of this year’s festival and the corresponding Legnica International Jewellery Competition, was ‘City’. The organizers of the HammerClub exhibition have thought to fit in with this topic. For the HammerClub exhibition works of seventeen silversmiths from nine countries were selected. Maja Houtman applied with Cartoon City. For the HammerClub Awards the object ended in fourth place. Exhibition associated with the Legnica Festival Silver and Hammerclub. This entry was posted in Exhibitions, Meetings on 05-06-2016 by Janjaap.